Drain the chickpeas and simmer in fresh water for about an hour or until tender. Reserve the cooking water. 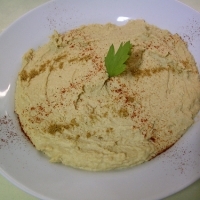 Process the chickpeas in a blender (or food processor) with the lemon juice, tahina, garlic, salt and enough of the cooking liquid to obtain a soft creamy consistency. Serve on a flat plate, garnished with a dribble of olive oil, a dusting of paprika (this is usually done in the shape of a cross) and a little parsley. Like aussie_meat_pie's recipes? Never miss an upload!